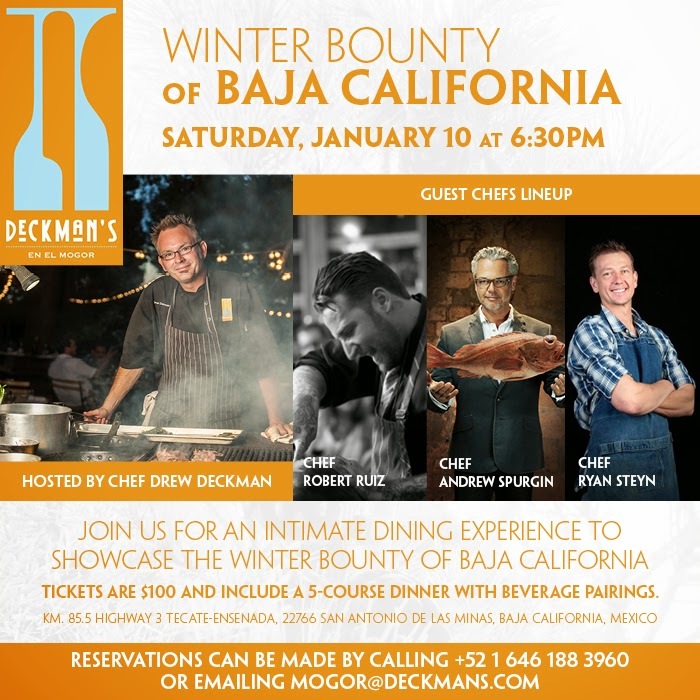 On Saturday, January 10, Deckman’s en el Mogor in Valle de Guadalupe will be hosting a culinary feast! For $100 (USD), guests will be able to dine on a five-course meal, paired with five wines to showcase the winter bounty of Baja California. The intimate 40-person meal will begin at 6:30pm and will be hosted by Chef Drew Deckman and guest chefs Robert Ruiz, Andrew Spurgin and Ryan Steyn. The dinner will include sustainable Baja ingredients with a strong focus on sustainable fisheries. Deckman’s en el Mogor stretches out in true country fashion at the edge el Mogor Badan’s vineyards, one of the richest wineries in the Guadalupe Valley. Wooden tables make up the welcoming “dining room,” loosely arranged under a canopy of pine trees and strands of twinkling bulb lights. Owner Drew Deckman’s kitchen is al fresco as well, utilizing reclaimed furnishings, such as a massive cutting board made up of floorboards and doors from a gym at San Diego State turned into a workstation. And, in the spirit of authenticity he cooks on a Baja-style, wood-only grill. This place is casual, but don’t let that fool you into thinking that Deckman’s en el Mogor is anything but special. Drew knows his way around the kitchen as a Michelin Star and Rising Star Chef recipient. He’s paid his dues at some pretty lofty locations around the globe. But he won’t tell you that. He’ll just make you a plate of something very special that will have you coming back for more. 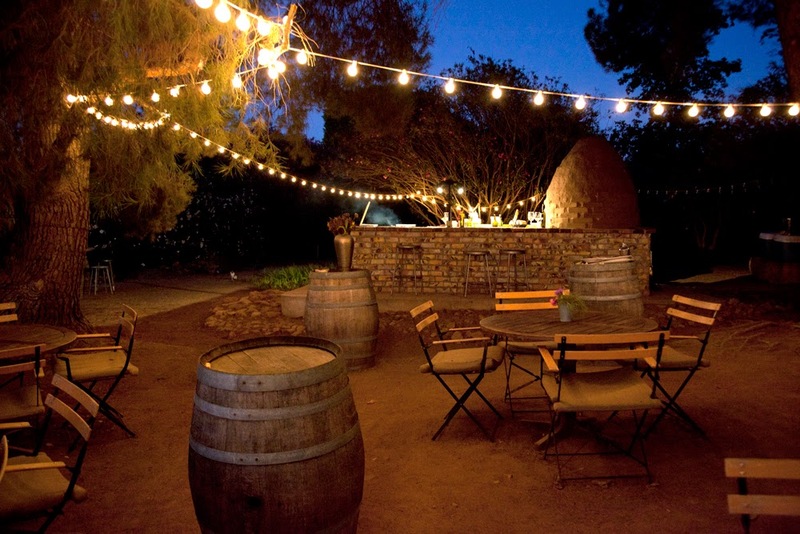 Serving Mexican-influenced haute cuisine daily from lunch until everyone is full from dinner, Deckman’s farm to table eatery sources local organic ingredients for every dish he prepares. Drew works wonders with local seafood, creating mouthwatering delicacies such as sea bass tartar with sesame and ginger, and gooseneck barnacle tempura. There’s beef tongue tiradito too, and ceviches to pair with exceptional wines from grapes grown just a few feet away. As a guest, you can eat up to seven courses featuring succulent heritage pork, local lamb or quail for example, and if you aren’t full by then, Drew will come up with something more. Discover your taste for the finest, under the clear Baja sky at Deckman’s en el Mogor. Reservations can be made by calling +52 1 646 188 3960 or by e-mailing mogor@deckmans.com.